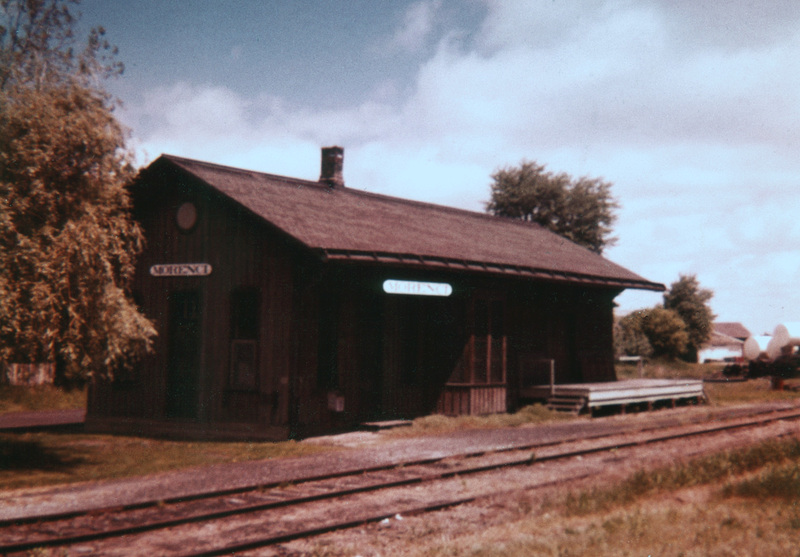 Hillsdale was once a division point and hub for the NYC’s southern Michigan branch lines. 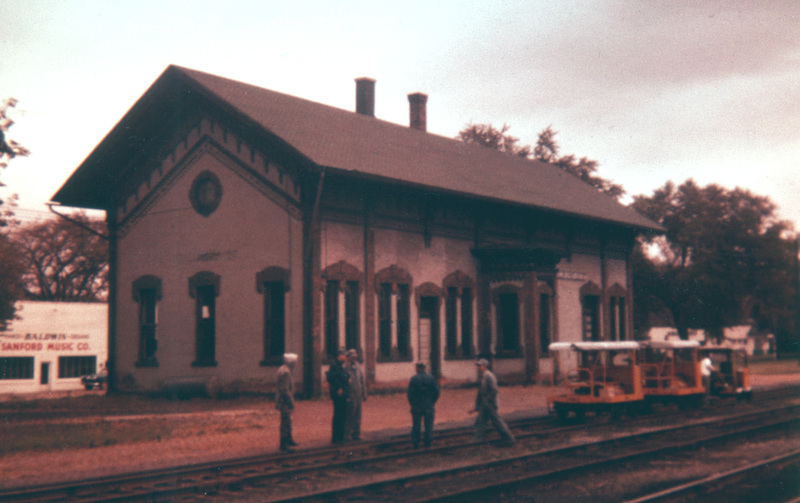 Here, en route from the “Cut-Off” to the Ypsilanti Branch, three motor cars pause in front of the ancient brick Hillsdale depot in the fall of 1961. The building survives to this day. This article originally appeared in Issue 34 of “The Speeder”, the publication of the Motor Car Collectors of America, in Autumn 1995. Over the last decade, the motor car hobby has grown, gained credibility and established a large following. For motor car owners, most of whom have been in the hobby less than ten years, the rides and trips being offered today provides variety and activity. To “old-timers” in the hobby, today’s activity is like a dream come true. Private operation of track cars began as early as 1877 when George S. Sheffield is credited with devising the velocipede as a means of getting to work over the tracks of (and without permission from) the Michigan Central Railroad. This seems to be an isolated case, however, and it wasn’t until the 1950’s that the first vestiges of private motor car operation appeared. At that time, some railroads were beginning to sell and scrap their motor cars as hy-rail trucks gained popularity. The New York Central was one of the first roads to do this, and it was the NYC that also indirectly planted the seed for today’s motor car mania. In the 1950’s, the NYC still had a network of branch lines connecting the small farming and manufacturing towns in the southeastern counties of Michigan. It was here that the idea of private motor car operation was born. A group of Toledo, Ohio railfans, led by Joseph Galloway, Gene Robideau, and lrv Estel, arranged to use a 6.5 mile NYC line known as the “Bankers Cut-Off”. The Bankers line, a part of the Ft. Wayne, Jackson and Saginaw Railroad, was on a 99-year lease to the NYC. The line bypassed nearby Hillsdale, and the railroad had no need for it; thus it sat unused. Galloway, a Toledo police sergeant who also headed the Toledo Railfans Association, arranged a $100-a-year lease with the NYC, and the other individuals chipped in to make the payment. With permission to use the line in hand, the group brought six motor cars to the property; four were ex-NYC and two ex-DT&I. The cars were stored at a rural location known as Bacon Road, and the group set out to make the line usable. The Cut-Off was not in bad condition, and with some brush cutting and tie replacement it was in good enough shape for the cars to be run on it. Some crossings were covered with dirt or paved over, but this did not bother the motor car enthusiasts, who were able to “portage” their machines across. For seventeen years, from 1956 until 1972, the group had a lease on the Bankers Cut-Off. On Sundays, they would journey to Hillsdale County to run the cars. Some days, they would obtain permission from the NYC dispatcher to venture onto the NYC’s “Old Road”, a Toledo-Elkhart, Ind. secondary main, from which they could access some of the other NYC branches in the area. The group ran trips on the NYC’s Jackson, Litchfield, Ypsilanti, Jackson and Ft. Wayne Branches, and ventured east on the Old Road to Toledo and west to Sturgis. Gary Zeitler, a Chicago, an Amtrak ticket agent, was a Toledo resident at the time, and took part in several of the trips. He recalls: “Looking at the DeLorme Michigan Atlas, it would appear that Bacon Road was where the first gate was across the tracks, with the motor cars stored just north of there. At Mechanic Road in 1961, Walter Metzger and Gary Zeitler pose next to motor car #1926, which appears to be some sort of ancient Fairmont gang car. There is a gate across the tracks just before the road crossing. “I don’t recall ever going south of Bacon Road, for whatever reason—too much growth over the rails? Most of the short runs made over the line would be between Bacon Road and north to Bean Road. North of Bacon Road and beyond the storage point, the line ran through the woods to a clearing where the line dropped on a stiff grade to a fill approaching Mechanic Road. Below the grade and entering the fill was a small open bridge over what would appear to be a creek leading to Middle Sand Lake. From Mechanic Road to Bean Road seemed to be open fields leading to a swamp area coming to Bean Road. “The trip we made was to Manchester, via Hillsdale, Brooklyn and Cement City. At Jonesville, we flagged highway US-12, and there was a boxcar in a siding outside of Jonesville, sitting on the switch. We moved that car into the siding to get by, several feet, with timber leverage on the wheels and brute force pushing . . . luckily it had roller bearings! “I always wondered what Irv Estel told the NYC dispatcher when he called in the Sunday movement of the motor cars. Don’t know what he might have said other than a railroad police inspection trip? It might have been a Saturday, but seems more like Sunday when there weren’t any trains moving in the area. I think at that time there weren’t any more “through train” movements possible on the Old Road as it was blocked with stored boxcar strings near Hudson. “Irv must have called the dispatcher from a line phone either at Jonesville or Hillsdale. Probably at Jonesville on entering an active line. The motor cars pause on an eastbound trip over the Ypsilanti Branch at Brooklyn, Mich. in fall 1961. Surprisingly, this building stands to this day, part of an antiques mall. 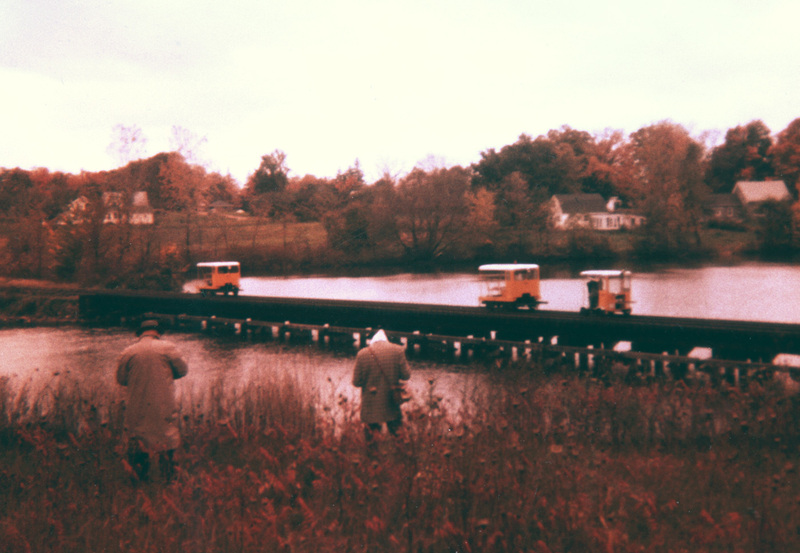 “At Manchester, the cars posed on a low wooden trestle over a small lake for photos . . . according to the map it’s the River Raisin. There was a dam there. We ate Sunday lunch in a small diner in Manchester, which filled the place. About 4 tables and counter service. It was a great roast beef dinner! 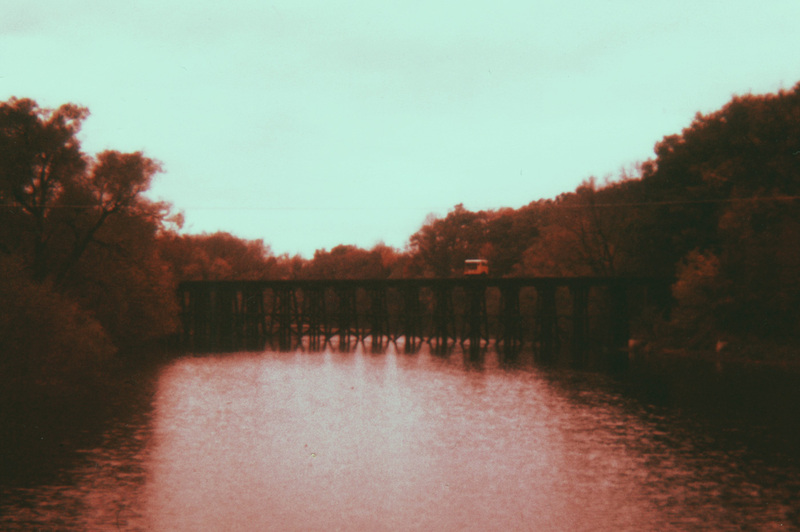 A motor car poses on the Ypsilanti Branch River Raisin bridge at Manchester, Mich. in the fall of 1961. This view is taken from the Main St. bridge, looking north. 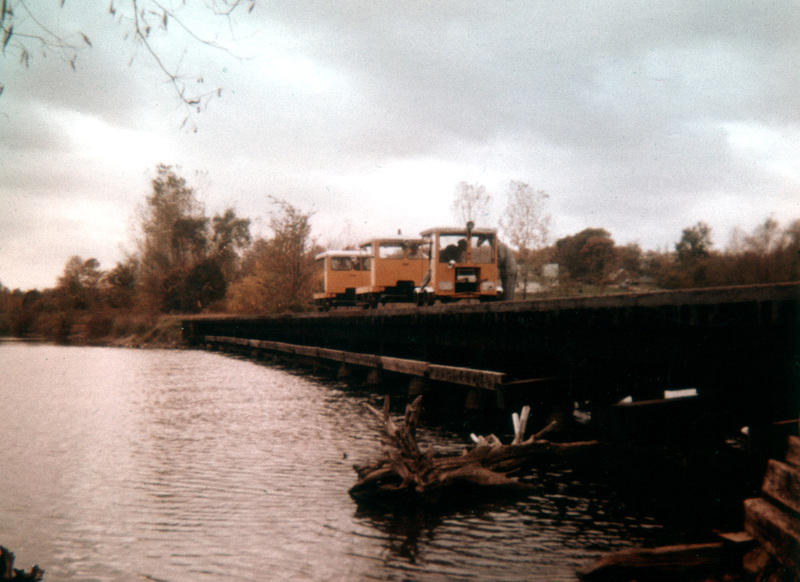 Southbound motor cars cross the Jackson Branch River Raisin bridge in Manchester in fall 1961. This bridge crossed the mill pond, just south of the dam. Another view of the River Raisin bridge on the Jackson Branch at Manchester. A group of motor cars sits at Lenawee Jct., MI, on the wye connecting the “Old Road” with the Jackson Branch. 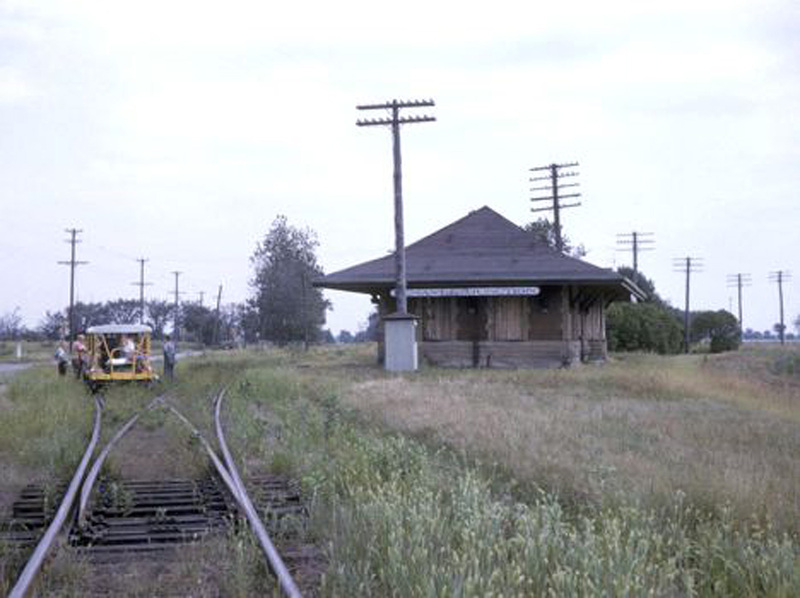 The depot survived until the mid-1970s; the phone box was later rescued by the Southern Michigan Railroad Society! The Toledoans’ ramblings came to an end in 1972 when the Ft. Wayne, Jackson and Saginaw Railroad’s 99-year lease expired and the road was absorbed by the Penn Central. The PC did not renew the motor car operators’ lease on the Cut-Off. The Cut-Off was torn up, as were the lines to Manchester, the Old Road between Hillsdale and Adrian, and many other former-NYC branches. 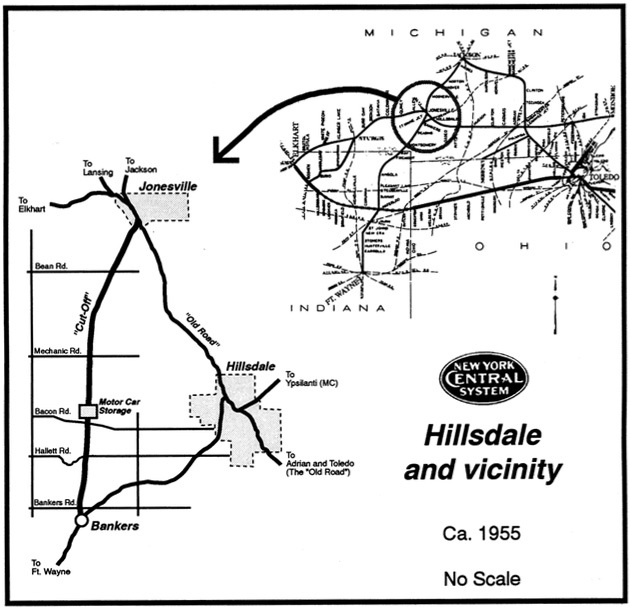 Remaining trackage in the Hillsdale area was later operated by the Hillsdale County Railroad Company. 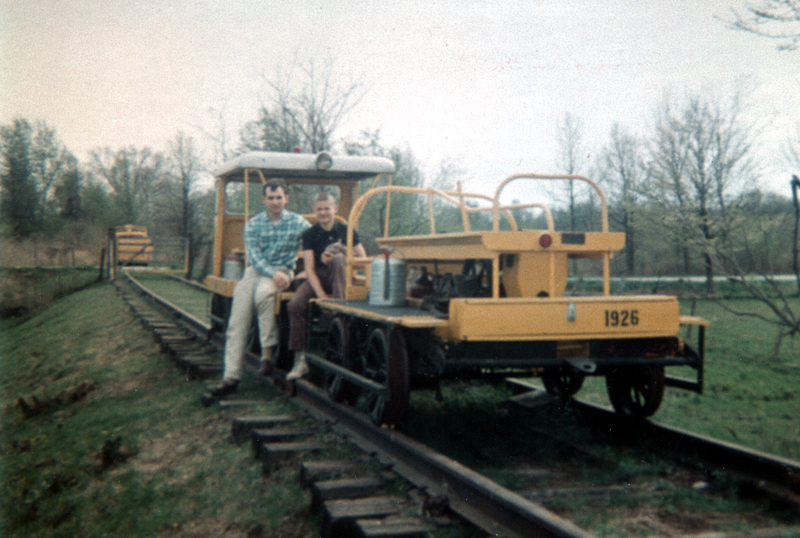 On a trip in Spring 1961, the motor car group reached Morenci, Mich. on an excursion. The old LS&MS depot here appears to already be closed. This building stood until about 1980. 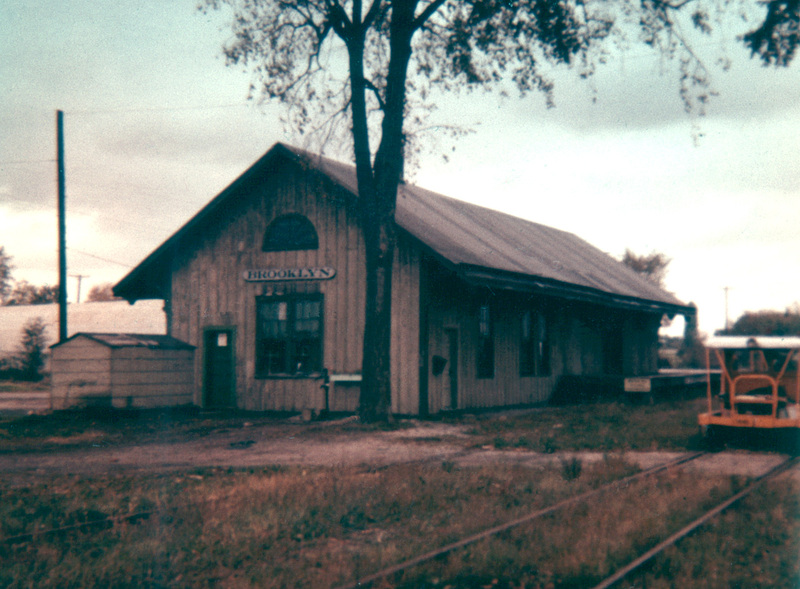 In 1982, the Southern Michigan Railroad Society, Inc. was formed to purchase and preserve a segment of the NYC’s former Jackson Branch between Clinton and Lenawee Junction, MI, one of the same lines the Toledo group had been running two decades earlier. Motor car operations began on the SMRS in 1983, and in 1985, the SMRS hosted the first National Motor Car Convention. Through this event, today’s motor car hobby was introduced to the masses! Find a railfan hotel at a great price! Stan Chausse, one of our long time members in Danville, IL, passed away some 25 years ago but Stan was one of the group that ran these motor car trips. His movies have been sold to Green Frog and many of them will be produced. Our NRHS Chapter will have rights to the motor car trips and the movies he took of the ventures. Very nice article, exactly what I wanteԁ to find.